Until recently, I’ve been using my old dissection kit carry case as a perfectly acceptable leather pen case. I say perfectly accessible, this I suppose is defined by what you find perfectly acceptable. The case dates back to my biology degree in the 1990s, and there are slots that will hold 12 large pens with a single (repaired) white elastic strip on a red, velvet backing. The zipper has broken too, so I hold it closed with a Papelote A5 notebook elastic pen strap, from Bureau Direct in the UK. I find this acceptable, because the dissection kit has a personal history, and I like to keep it in use. But, it’s getting to the point where taking it on the road, and that constant use, is going to damage the case beyond repair. I just can’t allow that to happen, so, a new pen case has become a necessity. I’ve cast around a bit for inspiration, and hit upon a couple of Galen Leather pen case reviews over at Inks and Pens (January 2017), and The Well-Appointed Desk (September, 2017). 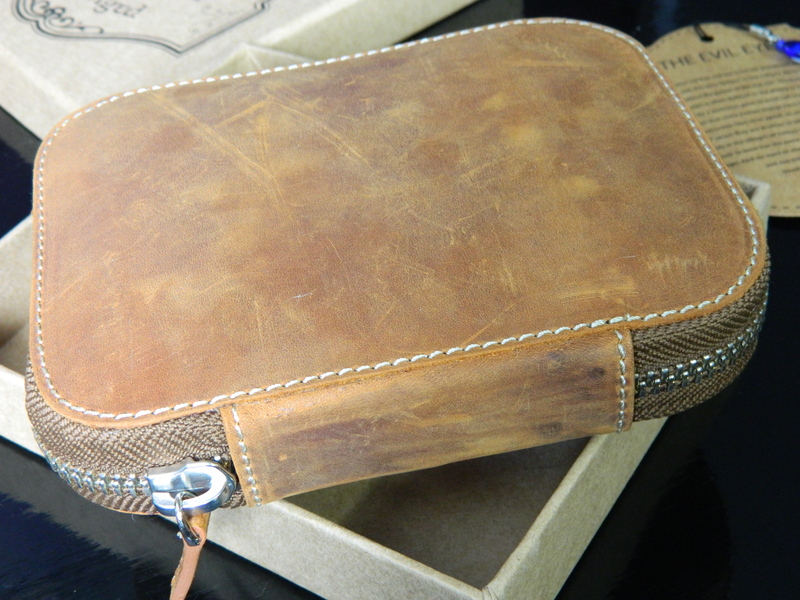 In the back of my mind, I kept the image of the Kaweco distressed leather pen case reviewed by Laura over at Fountain Follies, and how much I loved the color and the finish. 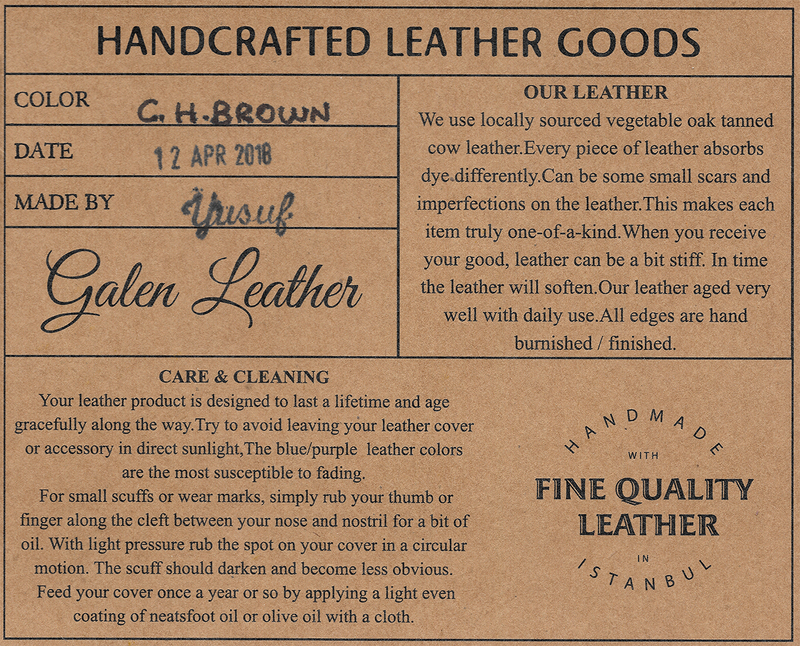 With all this in mind, I took a look at the Galen Leather web site, specifically for a 10 or 12 pen case, preferably in a leather and style similar to Laura’s distressed Kaweco. … is a small, family-run, business in Istanbul that specializes in handmade, quality leather covers for notebooks, iPads, phones, bags, and pen cases, at some competitive prices. Their products have had good reviews from most of the usual suspects, including The Pen Addict, The Gentleman Stationer, and edjelley.com. 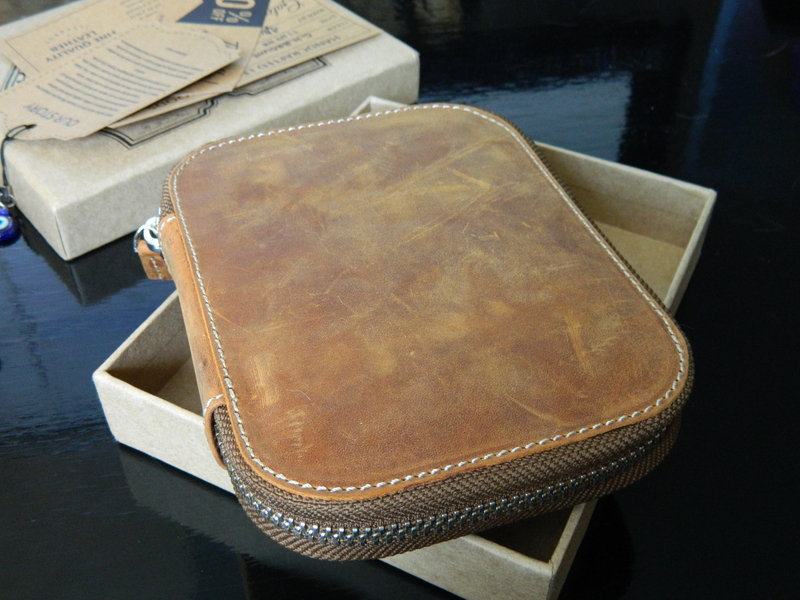 Browsing their site, it didn’t take me long to drill-down to their leather, zippered, 10-slot, pen case, in what they call Crazy Horse Brown. Their price was $58.00 USD (about $74.00 CAD), before taxes, shipping, and any relevant customs charges. This didn’t strike me as too expensive, but it was certainly at the top end of what I am willing to pay for a pen case. All the same, the pictures looked great. 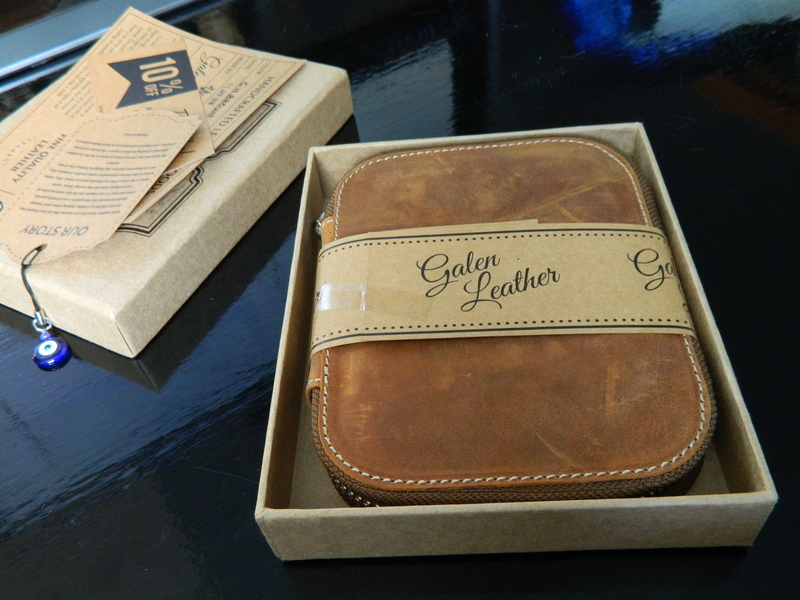 Galen Leather quote almost six weeks for manufacture and delivery, but this case made it to my desk in two weeks. As somebody who is extremely impatient with the delivery of new products, this pleases me a great deal. An information card with maintenance and cleaning tips for your product, and a 10% off your next purchase coupon card. 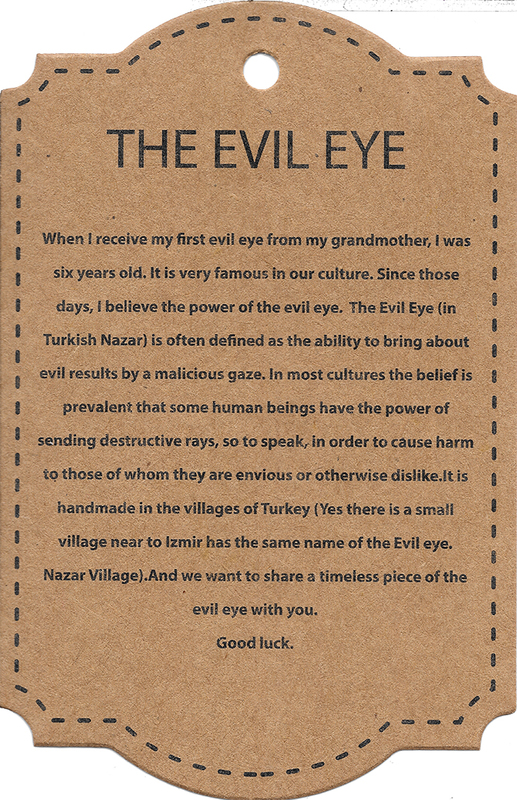 The Evil Eye pendant is a nice touch from the company, and the superstition says that it will help guard their customers from the malign gaze of anybody seeking to do them supernatural harm (read more here, and click on any of the smaller graphics for a full-size picture). 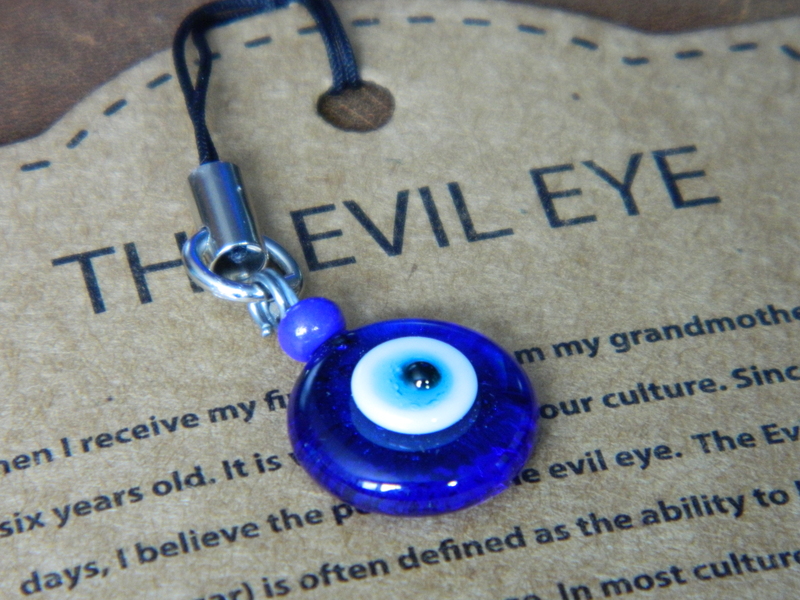 The Nazar Boncuk charm as it’s known in Turkey (the Evil Eye Bead) is a cute little extra, and my youngest daughter loves it. I’m not greatly tolerant of superstition, however well-meaning (in England, this was known as being a miserable old git). But none of this is the case we’re interested in, which comes neatly bound in a branded paper strip. I love the distressed look of the Crazy Horse Brown. It’s also very supple, soft, and flexible—a contrast to the stiffness of many other new leather products I’ve picked up over the years. 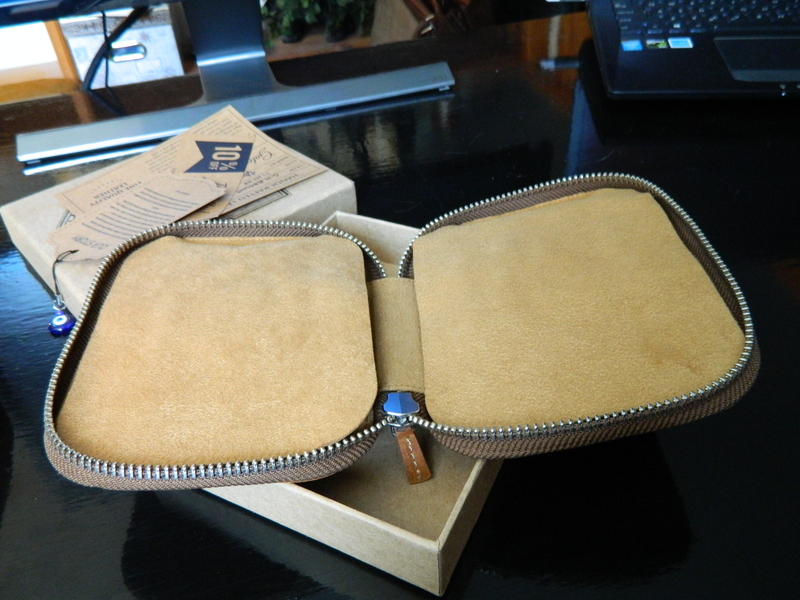 The case has a nice, chunky zipper and tag, which bespeaks a rugged durability. The leather scuffs fairly easily, but each of the marks rubs out with a little effort. Very few of the marks on the cover appear lasting, and the information has advice on how to deal with those. 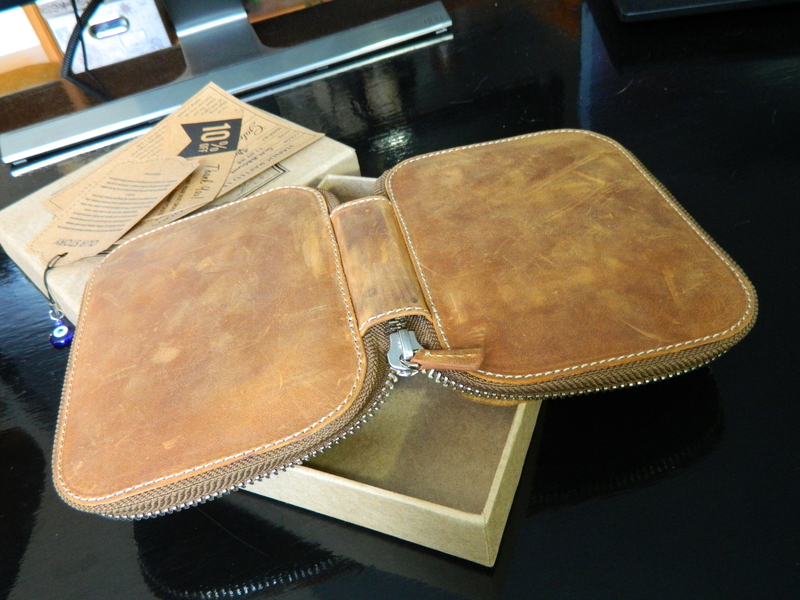 Folding the case open, the softness and flexibility of the leather allow it to fold flat with almost no resistance. 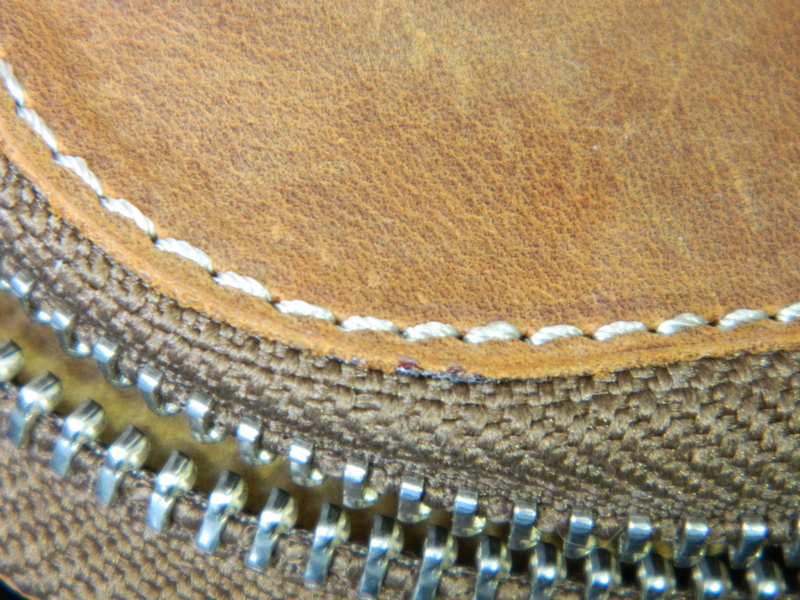 The stitching is uniform and, from my examination, shows no errors or fraying anywhere on the product. A closer look shows what I mean about uniformity and the quality of the handcrafted work. 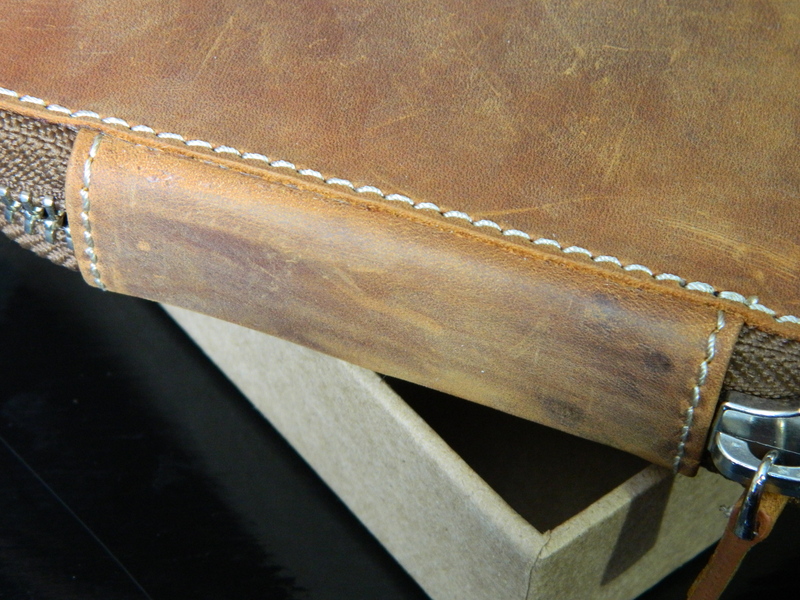 Flipping the pen-case over to the leather lining. 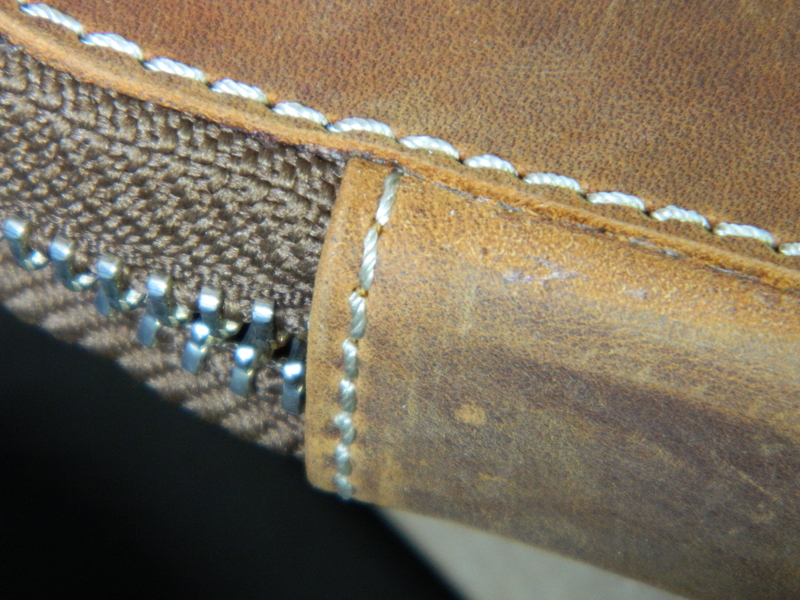 Pen slots on each side are protected by generous, soft leather flaps, that fold over the pens. Folding the flaps back, shows five pen slots on each side of the case. Given the full cover provided by the leather flaps, the single elastic strips holding each pen are fine to hold pens in place, but I suspect that exposed parts of each pen could still knock against its neighbor/s and result in minor scuffs and scratches; I’ll have to be aware of that, and watch out for it happening in use. 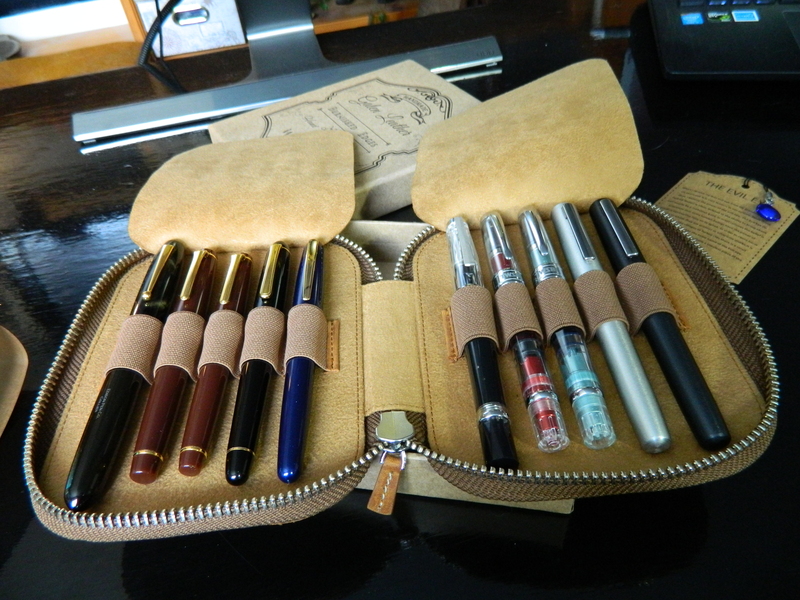 I loaded the case with the largest pens in my collection. Only the Edison Collier fills its slot with very little tolerance left for greater length or girth—and that, is a very big pen indeed (150mm/5.01in long capped; 14.9mm/0.59in diameter). Packed with large pens, the case zips closed easily, with no resistance. Past experience has taught me that cases that strain to hold their contents don’t last or maintain their condition anywhere near as long as I would like. 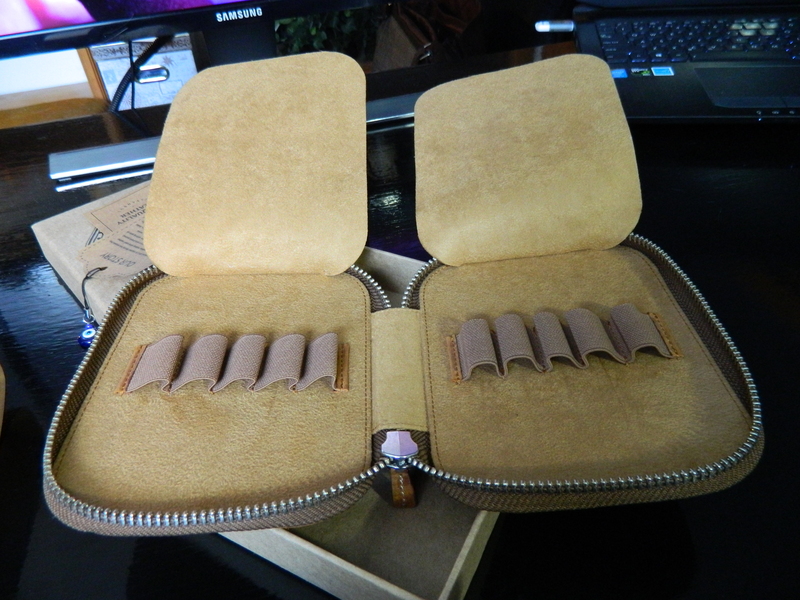 The Galen 10-slot Crazy Horse Brown pen case holds all I can stuff into it with ease. 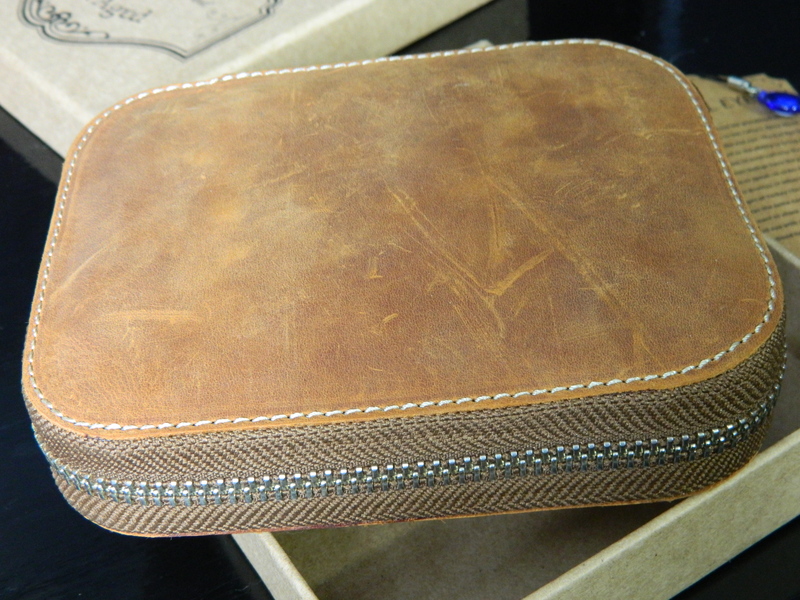 You can find the dimensions of this pen case on the Galen Leather web site. To be honest, the dimensions of cases like this—when empty—are of no real use or interest to me. I want to know how big they get when they’re full. How much space are they going to take up in a bag, when they’re carrying what I want them to carry? The answer is 165mm/6.5in tall, 138mm/5.4in wide, and 43mm/1.7in deep. This is smaller from top to bottom and left to right than an A5 notebook, and about as thick as two Rhodia A5 Web Notebooks. I am highly impressed with this product. 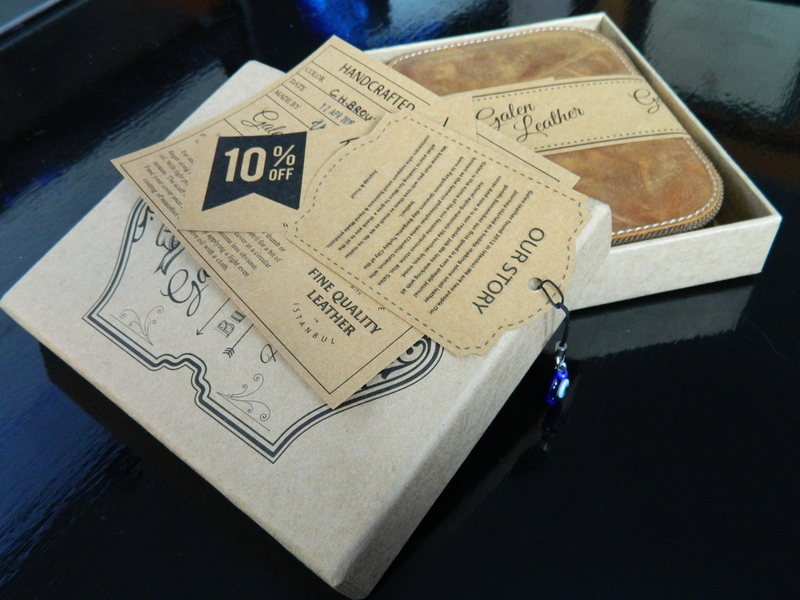 I have handled a lot of similar products over the years, and this stands out in terms of its handcrafted quality, suppleness and quality of the leather. 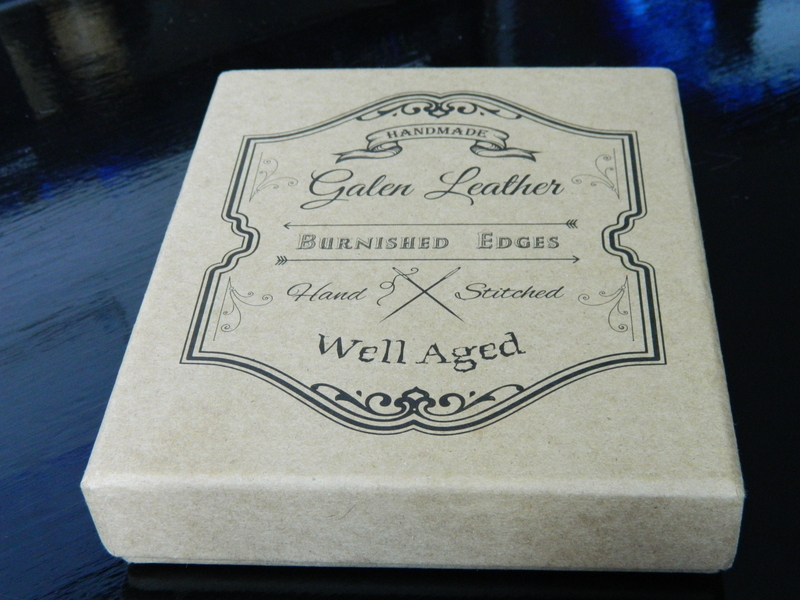 I’ll be watching the Galen Leather web site very carefully in the future, and I highly doubt that this will be the last of their products landing on my desk. ‹ PreviousIs there Anything New to Say About the Pilot Metropolitan? Looks nice – thanks for the detailed review. 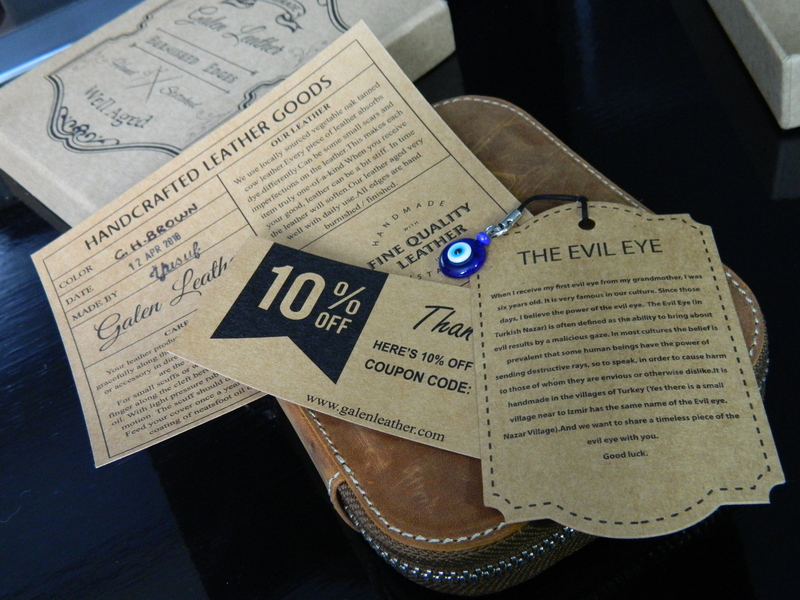 I have my eye on the Galen writing box. I just have to wait until my bank balance recovers from a pen-buying spree! Thanks for the detailed review and lovely pics. It was also interesting to see the pens in place and to compare the relative sizes of the Edison Collier and your Lamy aions. Also it is great when you can use the cardboard box as a desk-top pen box too. I was recently given some lovely Rheo Thompson candies, from Stratford, Ontario, by some friends visiting from Canada – which will be good for pens too!). The case looks great and will get even better with age. Thanks. Strangely, I am coming to like having the cardboard box on my desk more and more every day 🙂 Basically, I just stuffed the case with the biggest pens I had to see if they would all fit–no problem; the Collier was the only one that looked like it might stretch the elastic. I must have to look out for Rheo Thompson… Stratford isn’t that far away from us as the crow flies. Mind you, I should think he’d be pretty knackered by the time he got there.